Both my guy, Super G., and my step-dad, Lee, love peanut butter. The kids and I are pretty fond of it as well. While browsing my new addiction Pinterest, I ran across this chocolate cupcake that is stuffed with a ball of peanut butter filling and topped with a creamy peanut butter frosting… you know I had to make it for my guys! I had fears that the ball of filling in the middle would melt away as some other recipe makers had happen, it didn’t. They turned out perfectly, deliciously, sinfully good. This recipe makes 24 cupcakes, and I indulged in WAY too many of them, which is why I won’t be making them again for a long time. I can’t control myself around them! It’s hard to decide which is the best part! The frosting is like creamy peanut butter only amped up about 500 degrees, it isn’t too sweet, or too stiff. In fact it’s fairly soft and hardens up a bit in the fridge so be sure to chill it if you’re having a hard time piping. The cake itself is dense and chocolately and oh-so-good! And those balls! Oh those balls of peanut butter! they taste like a truffle. You’ll probably have four or five left over, eat them as is or dip them in a bit of melted chocolate for a sweet treat. To fill up my cupcake tins I used about 1-2 Tbs of batter, topped them with a peanut butter ball, that I slightly pressed into the batter, then topped with another tablespoon of batter. Gently spread the batter to cover that ball! Oh so good chocolate cake filled and topped with delicious peanut butter! Preheat oven to 350°. Line 24 cupcake tins with a double layer of paper liners. combine powdered sugar, peanut butter, butter and vanilla in bowl. Beat on medium speed until well combined and mixtue is dry yet holds together. Roll into 1-inch balls, place baking sheet and chill in freezer while you make batter (10 minutes). combine flour, cocoa powder, baking soda and salt in a medium bowl with whisk. In a liquid measuring cup, stir together sour cream, milk and vanilla. In large bowl, beat butter and sugar on medium-high until light and fluffy, about 2 minutes. Beat in the eggs one at a time, scraping down bowl as needed. With mixer on low speed, alternately add dry ingredients and sour cream mixture, beginning and ending with dry ingredients. Mix just until incorporated. Into liners, spoon a tablespoon or two of batter. 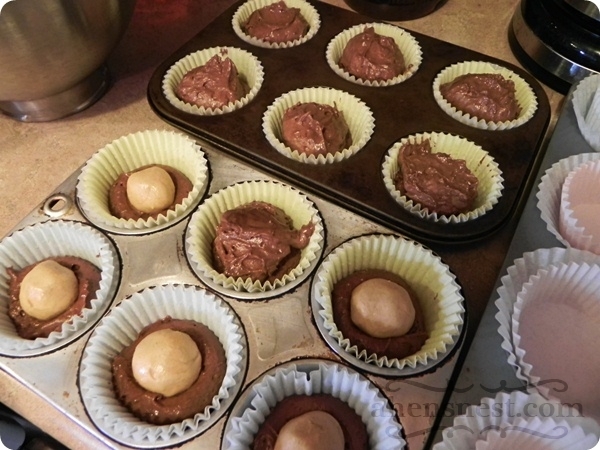 Place one chilled ball of peanut butter filling into each cupcake well and top with remaining batter. Bake for 13-22 minutes, or until toothpick comes out clean. Cool in pans for 5-10 minutes, then transfer to wire rack and cool completely before frosting. beat together cream cheese, butter and peanut butter until smooth. Slowly mix in powdered sugar, beating until smooth and well blended. Gently fold in cool whip until well blended and fluffy (chill frosting for 10 minutes if it's too soft). Frost cooled cupcakes and eat! This look delicious. My wife and I too, love peanut butter- from Reese’s to Captn Crunch. Your presentation looks great . Thanks for the recipe. OH YES! I will be trying this recipe for sure! I LOVE peanut butter and chocolate together! Thanks for the pin Kasey!! These look fantastic! I know my kids would love these at their next birthday party. OH. My.GOSH. I just made these today and they are to DIE FOR!!! I found it over on Pinterest and wasn’t suprised to see who had made these. :) Came together beautifully although you may want to correct the frosting amount of peanut butter – it only says c not 1/2 cup! Thanks for an excellent recipe! I’m from Brazil and I love PB so much that I buy it every time I go to the US or I ask my friends over there to send it to me (we don’t have it over here). 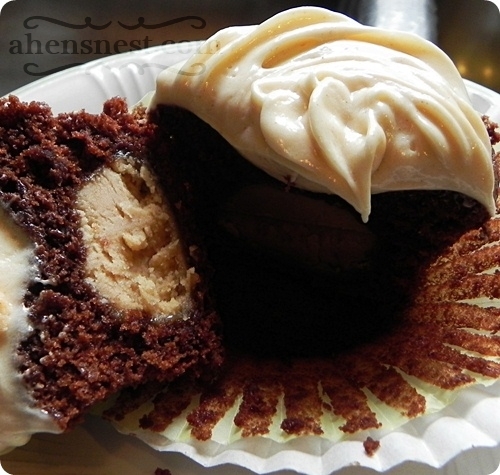 I was looking for a good PB/Chocolate Cupcake to bake for Xmas and I’m definitely going with this one. These cupcakes look too yummy. Thanks for the recipe. Thanks for another great recipe! I made these for my husband to take to work and they were an absolute hit. I gave them a 5 star rating on my Pinterest Kitchen post today! I was wondering if for the filling recipe if it was 1 &1/4 cup of powdered sugar or only 1/4 cup. The way it’s written is a little confusing. Hi Kasey, sorry for the confusion, that should read 1 – 1 1/4 cups of powdered sugar — meaning if the filling is a little loose with only 1 cup you can add up to 1/4 more, does that help? Just wondering the answer to the last question about how much powdered sugar to use in the filling. I was really hoping to make these for a party tomorrow. THanks. Hi Jenn, that shoulld read 1 – 1 1/4 cups of powdered sugar — meaning if the filling is a little loose with only 1 cup you can add up to 1/4 more, does that help? Hi, this recipe looks really amazing. Since I’m a Swede living in my homeland cool whip is not available (I don’t really know what it is to be frank) is there something else I can use? I’m guessing it has the same kind of consistency as whipped egg whites or whipped cream? I just made these and they looked great!!! except my peanut butter balls went flat! any idea what i did wrong? Oh no! Were the balls of filling frozen? You might try leaving them in the freezer a bit longer, up to an hour! Also, I used the whole amount of powdered sugar 1 1/4cups and froze until they were hard before using — I hope that helps! 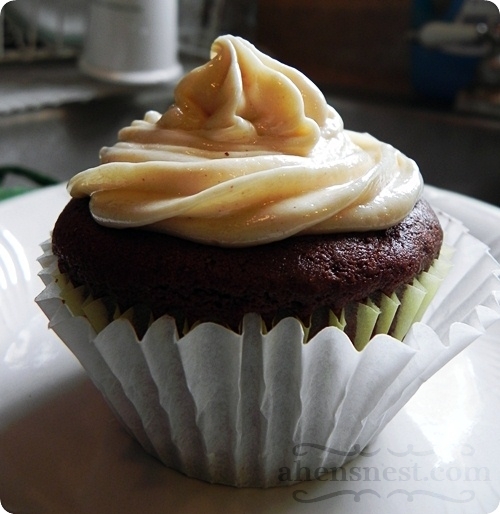 There are also some tips in the comments of the original recipe over at http://annies-eats.com/2009/11/06/chocolate-peanut-butter-cupcakes/! This recipe is amazing! Thanks for sharing. I substituted 1/2 cup of oil for the butter and the cake came out light and fluffy — simply perfect! Also to keep the peanut butter balls from sinking I froze them till they were solid and dusted them with a bit of flour before placing them inside of the batter. I also wanted to emphasize that it’s really important with this recipe to cover the tops of the peanut butter balls. I left two uncovered for the fun of it, although the batter rose, it did not spread over the peanut butter in the oven. Thanks again! Just made these to satisfy my caving during my fav cupcake show. These are sooooo good! These cupcakes are delicious! I’ve even made them with a dark chocolate brownie box mix with no frosting and result is to die for. Thanks for the great recipe.